Congratulations to Mehul Patel on becoming Firefox Student Ambassadors of the Month June 2015. He started an "FSA Summer Camp" initiative teaching students about different contribution areas in Mozilla every week for 2 months. Congratulations to LU Firefox Club on becoming Firefox Club of the Month June 2015! They recently hosted a MozAwareness event, driving Firefox for Android downloads and #FoxYeah creations to 150+ attendees! Thanks to Cameron McCormack for massive memory performance improvements in Firefox 41 for people using ad-blockers in Firefox. See "Firefox 41 will use less memory when running AdBlock Plus" for details. Congratulations to Atique Ahmed Ziad, the newest Friend of Marketplace! In addition to fixing bugs on Marketplace, Atique has also been mentoring others to do the same. Thanks Atique! After a 2 week hiatus, The Joy of Coding is BACK! Watch an engineer hack on Firefox live! 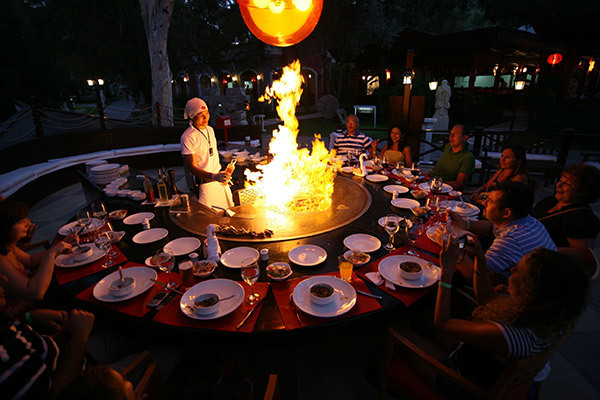 It's like teppanyaki, but for source code! Episode 20 will be on Air Mozilla at 10AM PT / 1PM ET / 5PM GMT, and then on this YouTube playlist not long after. Mozillians attending include Dave Camp and Jeff Griffiths and Potch! FISL 16, Porto Alegre, Brazil. 8th - 11th. One of the biggest Open Source events in the world, and the most important for the region. FISL is the place where all the Open Source communities can learn about the latest news, and help to build a more fair humanity with open knowledge. Mozilla presence this year will be with a dedicated Room, where Reps will give talks, workshops and demos. More info on the official site. TuxCon 2015, Plovdiv, Bulgaria. 11th and 12th. TuxCon is a free community event about free and open-source software for Internet of Things, mobile, embedded and wearable devices. The twitter hashtag of the event is #TuxCon. Mozilla Weekend Berlin, Berlin, Germany. 11th and 12th. Mozilla Weekend will be the first of its kind in Germany. We will have talks on Saturday and workshops to go in depth on Sunday. We will focus on coders as well as non-coders. This means that everybody will find something interesting and will be able to work on something in the workshops. Event organized by Michael Kohler and Elio Qoshi. Mozilla L10N/QA Hackaton, Lima, Peru. 11th and 12th. At this hackathon, Mozillians will receive training on the latest projects within those functional areas plus community growth within both l10n and QA for LATAM communities. For all details about this event, please sse the event's wiki page. The fifth annual IndieWebCamp is July 11-12 in Portland Oregon as usual, and simultaneously Brighton, England this year! IndieWebCamp is a 2-day creator camp focused on growing the independent web. Mariusz Kierski Eric Faust Mountain View Mountain View JS Eng. bug 1171523 "Loop" product renamed to "Loop (Hello)"
This page was last modified on 6 July 2015, at 17:39.